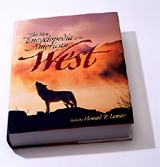 PREEMINENT WESTERN HISTORIAN and former Yale University president Howard R. Lamar 45C has garnered many honors for his sweeping, million-word work, The New Encyclopedia of the American West, among them the 1998 Western Heritage Award from the National Cowboy Hall of Fame and selection as one of the top ten reference books of the year by Library Journal. And this fall, Yale honored Lamars contributions to the field when it dedicated the Howard Lamar Center for the Study of Frontiers and Borders, devoted to the study of the frontier experience, the American West, and Native American history. But for Yale University Press editor Charles Grench, who led a staff of five editors in editing the thirteen-hundred-page book, the most memorable aspect of his involvement with the project came when he accompanied Lamar to the Cowboy Hall of Fame in Oklahoma City. Grench drops to a whisper. Howard Lamar shares Grenchs fascination with the West, the most American part of the country, and his awe for its legends. Im a dude turned Westerner, the dean of frontier scholarship says from his home in New Haven, Connecticut. Born on an Alabama cotton plantation, Lamar graduated from Emory College in 1945 and received his masters and Ph.D. degrees from Yale, where he has spent most of his academic career. He is perhaps best known at Emory for his service as chair of an external committee of educators that helped define the Universitys path to preeminence in the years following the 1979 Woodruff gift. The siren song of Western mythology, first heard in childhood, has remained as alluring to him as it has to millions of his countrymen. Lamars comprehensive reference is chock-full of such heroes: Cochise, Annie Oakley, Davy Crockett, Daniel Boone. In entries that range from A (A&M colleges) to Z (Zuni Indians). The New Encyclopedia of the American West also recounts historic events, enduring myths, cultural phenomena, and such larger-than-life concepts as Manifest Destiny. Serendipitously, New Yorker William Robertson Coe, a wealthy professional buff whod bought Buffalo Bill Codys ranch in Wyoming, had recently enriched Yales Western studies department with a vast collection of material including diaries, maps, newspaper articles, letters signed by famous figures, and a trove of original Western art. He also endowed the collection with a budget that made Yale one of the four top sources for Western research materials in the country. Lamar found the collection had a friendly curator, and soon he had his dissertation subject: frontier politics in the Dakotas. In the summer of 1951, Lamar took a three-month trip to explore the Black Hills country. Realizing that the story of the West offered a window on American history, he found more than a dissertation subjecthe found his lifes work. I fell in love with the West, he says. After Yale offered him a Western seminar to teach, he says, I went back every summer. His dissertation was published in 1956 and his teaching duties grew. I trained sixty graduate students and Ph.D. candidates, says Lamar. Many are now teaching in the West. Over the span of his career, he would also publish six more books about the region. One of those works was an ambitious project launched in 1965 and published in 1978 as The Readers Encyclopedia of the West, which Library Journal praised as not only a useful reference tool, but [also] a delight to browse in. Almost immediately, Lamar started to update it. In 1994, Lamar again was able to take up work on the book. The scope of the project was daunting. He contacted six hundred scientists, archivists, geologists, and cultural historians, three hundred of whom became contributors. Fifteen graduate students did legwork in the library, updated old material, and contributed some of the twenty-four-hundred entries. Lamar wrote about one hundred essays himself and revised another five hundred. Every word of the original work was reviewed and updated, and more history of the urban, twentieth-century West was added. At Yale University Press, Charles Grench assigned five editors to work on the five-thousand-page manuscript. Photos were supplied from repositories around the country and contemporary Western photographers. The Coe collection provided scrapbooks, stereopticons, and Carleton Watkins photography. Published in October 1998, the book received strong reviews and has sold around twelve thousand copies. It seems to me to be a kind of representation of the best work were able to do, says Grench. Still there were objections. Texas novelist Larry McMurtry wrote a review grousing about the lack of an entry for chili. More significantly, the New Encyclopedia incorporates recent scholarship on the contributions of women, minorities, and native people while building on previous historians groundwork. Perhaps the only subject to bring higher praise than Lamars book is Lamar himself. The new Howard R. Lamar Center for the Study of Frontiers and Borders will offer fellowships and research grants on Western studies, establish a collection, and hold lectures and an annual conference. Krista Reese is a frequent contributor to Emory Magazine.